The First Order strikes back with the Star Wars The Force Awakens Kylo Ren Bladebuilders Lightsaber! Plug in a smaller weapon to the bottom of this expandable blade system. Just flick your wrist and you're ready for triple-bladed combat, just like Kylo Ren! Connect with other Bladebuilders lightsabers (sold separately) to make the baddest blade this side of the Anoat system! Comes with 1x light saber, 1x Light Dagger. Requires 2x"AA" batteries, included. 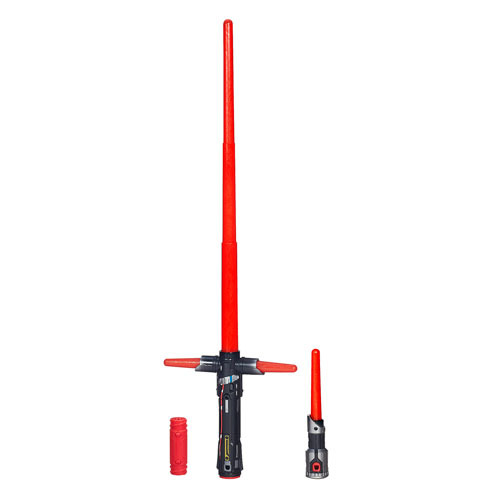 Light saber measures 22-inches, and light Dagger measures 9-inches. Ages 4 and up.